Hello and Happy New Year to you all! 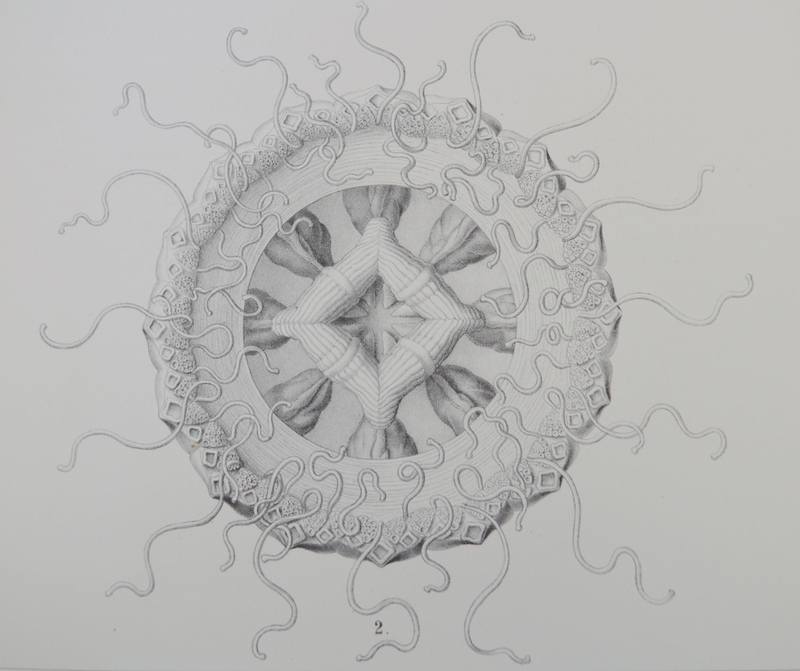 January’s jellyfish! 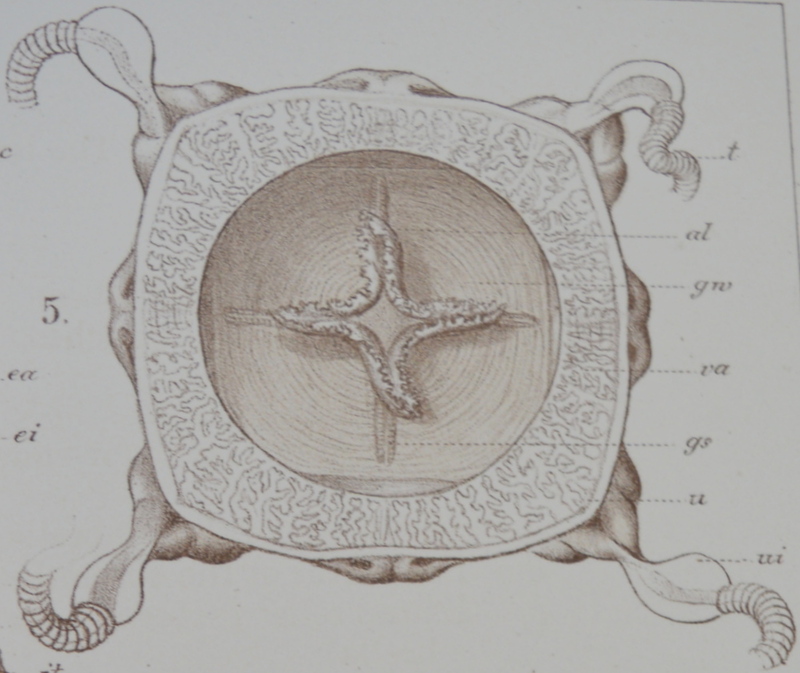 For this month’s post I am going to tell you about two species of the jellyfish found around the seas from the HMS Challenger expedition. They are named differently now but after a bit of research we found out what their current names/species are. Let’s start with the genus Carybdea – the jellyfish belonging to this genus are known as box jellyfish – you don’t want to mess with these! They are highly venomous and their sting attacks the heart and nervous system, which can instantly kill prey. These jellyfish have tentacles from each corner of their bell, each one with about 5000 stinging cells. The two females found by the Challenger (Charybdea murrayana, now Carybdea murrayana) were found on April 9th 1876 at station 348, off the West Coast of Africa, not far from Sierra Leone. An interesting fact about box jellyfish is that they have ‘true’ eyes (as well as simple eyes). The simple eyes just detect light but the ‘true’ eyes have a retina, lense and cornea. It has been shown that these are used to help navigate by looking upwards to the mangrove canopies. This is where they usually feed and by detecting the canopies they stay underneath them to ensure they don’t stray too far from home. If cover is removed, they have no sense of orientation. Next up we have the genus Ptychogastria. These don’t have a common name and only one of these jellyfish was found on the expedition. These attractive jellyfish are from the order Trachymedusae. A lot of jellyfish have two body forms – polyp (stationary) and medusa (free-swimming). However, this order of jellyfish just grows in to the medusa stage. Although they grow only into the free-swimming form, they have suckers to attach themselves to rocks, waiting for prey to pass so they can reach out their tentacles to capture them. So they don’t swim that much after all! 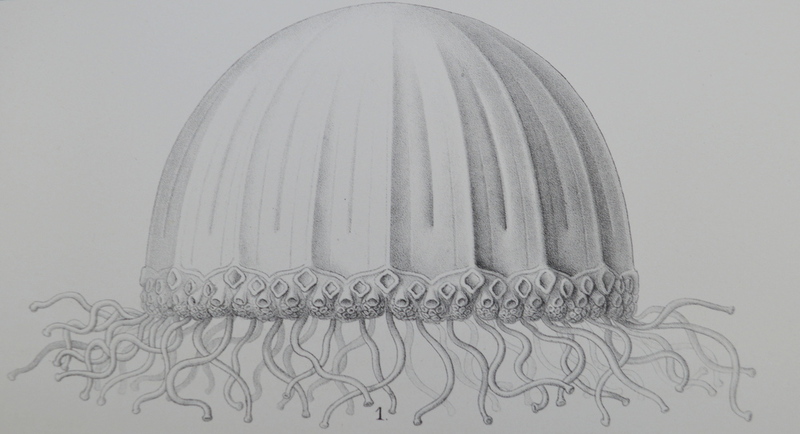 The one Ptychogastria jellyfish found was from station 50 – on the 21st May 1873 near Halifax, off the east of Canada. It was then identified as Pectyllis arctica but has since been updated to Ptychogastria polaris. Thanks for reading and see you next month! 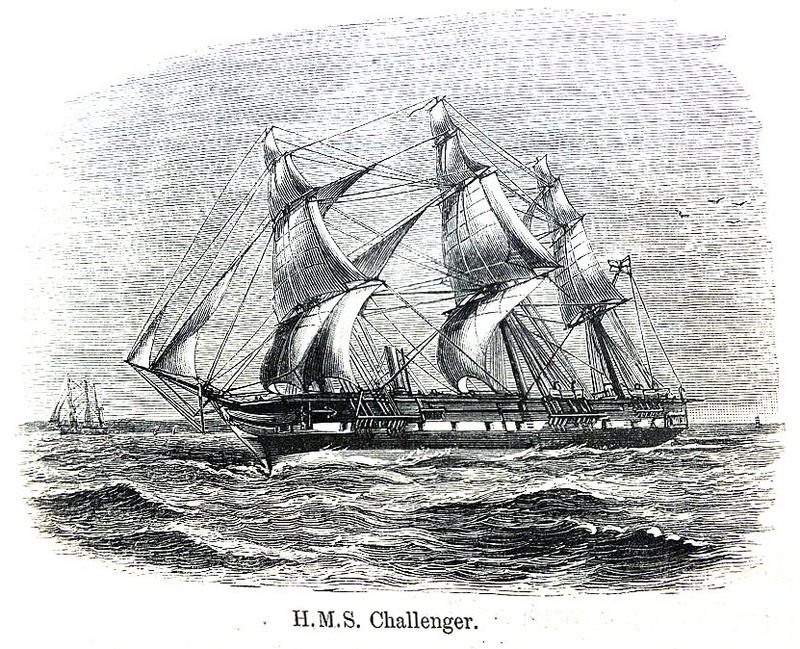 Challenger set sail on 21st December 1872, just in time for Christmas. 142 years ago from the day this post was published! Unfortunately, Christmas this year was a bit of a miserable one weather-wise. It was very windy, with the crew having to hold tight to their food dishes – many were lost and some food jars, in particular jam and pickles, got smashed on the floor. However, with ham for breakfast and meat pie and plum pudding for dinner the food went down quite well. Every member on the ship was given a third of a pint of sherry too. The officers weren’t so lucky with their food though. The turkey was stolen and they never found out who it was. The HMS Challenger spent the second Christmas off Prince Edward Island – belonging to South Africa. Again, the sea was very rough. At about 10am, the crew caught sight of land but they weren’t due to anchor until Boxing Day. Dinner this year was salt pork and pea soup, plum pudding and a third pint of madeira for each man so quite enjoyable, with music and dancing for entertainment. The men were thinking about where they were going to be the following years at Christmas – around Hong Kong in 74 and near Valparaiso in 75. When the men anchored on Boxing Day and explored the island they saw many birds – cormorants, albatross, skua, gulls, a giant petrel, prion and a sheathbill. This was on top on three different penguins. One of these was the Gentoo penguin. This penguin is nearly as big as the King Penguin, which was also found on the island. The third of the penguins was the rockhopper penguin, who had very dirty looking nests. Have a look at their photograph of the albatross nests below. Indeed, the ship was in China over Christmas in 1874. They arrived in Hong Kong on 16th November 1874 and stayed there until the beginning of January. Christmas here was lovely and warm – nothing like the cold and wet weather of the previous years. A fine dinner with turkeys, geese, ham and of course the plum pudding was devoured by all. Members of the crew save money each month for when they are at land to treat themselves. In Hong Kong they often ate curried cats and dogs..a delicacy there at the time apparently! The final Christmas on board! 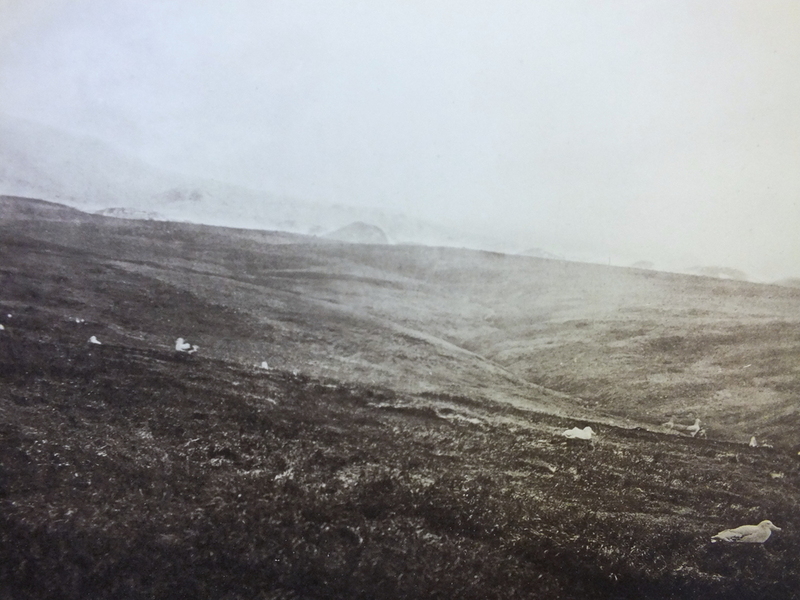 The men were once again correct in 1873 – they had just left Valparaiso on the 10th December. Unfortunately six men were lost there from leaving without consent. Christmas Eve brought music and dancing with a band and many stage acts which was great fun for the men. It was a cold Christmas day at sea this year. Dinner this year was a fat bullock to keep them going. Of course we can’t forget about the plum puddings! Christmas was very enjoyable until the evening. Many of the seamen managed to smuggle in multiple bottles of alcohol, leaving many drunk and fighting terribly. One man even came away with a broken jaw in three places! So it didn’t turn out terribly well in the end but it was all self inflicted! So those are the main details we have about Christmas on HMS Challenger – food, drink, music, dancing, a mix of weather and the occasional fights (what’s changed?!). Seriously though, life wasn’t easy – I’m sure those men were relieved to have their next Christmas on land with family where they belong. Have a happy Christmas and New Year everyone!